SIMILARLY USED SPECIES: A. blitus; A. caudatus; A. dubius; A. edulis; A. hibridus; A. hypochondriacus; A. viridus. Please note that for all practical purposes, A. viridus can be used as a substitiute for A. spinosus. A lot easier on the hands, too, as A. viridus has no spines. COMMON NAMES: Pakai (Amaranthus spp. ), pakai kükü (A. spinosus)[Hawai’i]; zhi xian, tz’u hsien-ts’ai, [China]; tanduliyah [India] ban lunde [Nepal]; amaranth, spiny amaranth (A. spinosus), red cockscomb, love-lies-bleeding, pigweed [USA]; chiori con espinas [Bolivia]; khichka jat’aqo [Quechua]; mullu keerai, neer keerai, tanduliuyah [India]; gansam lodut, surindi [Borneo]; ntungu [Tanzania]. NOMENCLATURE: Amaranthus is from the Greek “amarantos” which means “unfading,” a reference to the persisting color of certain amaranth flowers. Or…. the name Amara means “bitter.” Take your pick. Spinosus means “spiny,” as does kükü. CATEGORY: Herbs that stop bleeding~. 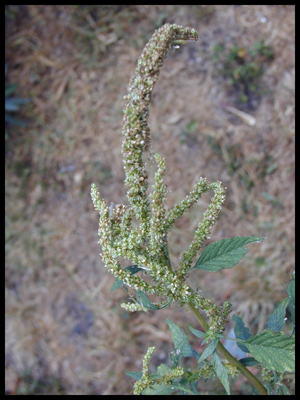 TOXICITY: Amaranthus retroflexus (not known to grow in Hawai’i) is reportedly nephrotoxic to large domestic animals [Oladosu 1979], although not to rabbits [Schamber 1985]. In China, the roots are said to be mildly toxic and overdose can cause dizziness, nausea, and vomiting. CAUTIONS AND CONTRAINDICATIONS: Never treat bleeding without first determining its cause. Not in menstruation or pregnancy. Caution with osteoporosis or calcium imbalances~ [Larsen 2003]. See Use As Food above. The genus has been reported to cause dermatitis and photosensitivity. The pollen has been reported to cause keratitis of the eye. PREPARATION OF MEDICINE: Usually decocted or poulticed. DOSAGE: 10 grams in formula, 30 – 60 grams as a single herb. Up to 300 grams of the fresh root is used in China for duodenal and gastric ulcers. (I would not consider using such a dose). STATUS IN HAWAI’I: Alien bad boy. WESTERN FUNCTIONS REPORTED: Antiemetic; anti-inflammatory; astringent; blood purifier; carminative; diaphoretic; diuretic; emmenagogue; emollient; expectorant; febrifuge; galactogogue; hemostatic; improves digestion; lactogogue; laxative; mucilaginous; promotes appetite; purgative; sudorific. OTHER ENERGETIC FUNCTIONS: Benefits pitta and kapha. Insect bites [Philippines (leaves)]; scorpion sting [India (root)]; snakebite (root internal) [Ghana, India, Philippines]. Mild internal bleeding [China, India]. Topical for eczema (leaves & root) [China, India, Nepal, Philippines]; psoriasis [Philippines (leaves)]. Burns (leaves poulticed) [Nepal, Philippines]. Enteritis, dysentery [Borneo, China]; mild diarrhea [USA]. Gastric or duodenal ulcer [China]. Toothache [India (root chewed with salt)]. Gall bladder inflammation, gall stones [China]. Topical for boils, abscesses (leaves or root poulticed) [China, India, Nepal]; foot sores (stem decocted, topical) [India]. Tumors (poulticed) [Mauritius, Java, South East Asia]. Laxative for children [Nepal (leaves and roots boiled)]. Ceremonial medicine in “Green Corn Medicine” [Cherokee]. Excess menstrual bleeding (leaves, roots) [Cherokee, India, Nepal]; abnormal uterine bleeding. Edema during pregnancy [India (young leaves internal)]. Gonorrhea, genital discharge [India, Nepal]. Edema (in bath or leaves as a vegetable) [Ghana, India]. Burningsensations, “heat in the body” [India (seed)]. USE AS FOOD: High in protein and calcium. It is used as a food crop by the Aztec Indians of Mexico, as a spinach substitute in Australia, and as a vegetable in China. The seeds can be boiled into a hot cereal. Cook for at least an hour. The young shoots make a very tasty potherb or in salads. While high in calcium, however, Amaranth that also contains large amounts of oxalates may actually inhibit calcium absorption [Larsen 2003]. Because it may absorb nitrates from the soil and form oxalate crystals in the leaves, only organic pakai should be used [Elpel 2000]. OTHER USES: In Swaziland the ash of whole plant used as a snuff, sometimes alone and sometimes with tobacco. A red dye made from Pakai kuku is used to color food and medicine. A green and yellow dye can be made from the whole plant. Bleeding: add Erigeron canadensis (fleabane), Eclipta prostrata (han lian cao), and Capsella rubella (shepherds purse). Post partum: Stem pulp with castor oil [India]. To cause abortion: With Carica papaya (hë’ï), Tamarindus indica, Plumbago zeylanica (‘ilie’e) & Capsicum annum (nïoi) [India]. RANGE: Southeast Asia, Malaysia, Southern Africa. Native to tropical Americas. Accidentally brought into Hawai’i in 1900. GATHERING: Use the young ones… or use gloves. When gathering as food, take the young shoots. Can cause hay fever. PROPAGATION & CULTIVATION: Don’t. Seeds are dispersed by water & have long viability. The essential oil of Amaranth spp. lowers cholesterol in hamsters and the seeds of Amaranthus esculantus lowers cholesterol in rats [Berger 2003; Chaturvedi 1993]. A. caudatus and A. paniculatus seeds are antioxidant [Klimczak 2002]. The family amaranthaceae includes more than 900 species in 60 genera. Most Amaranths photosynthesize using a different method than some other plants. Called the “C4 carbon-fixation pathway,” it is a mechanism best suited for sunny areas. A. spinosus and A. viridus are used almost interchangeably, with A. viridus preferred as it has no spines. Up to 66% of weed species are said to be edible. While “edible” and “digestible” may not always be the samething, young A. viridus and A. spinosus are definitely both. Berger A, Gremaud G, et al. 2003. Cholesterol-lowering properties of amaranth grain and oil in hamsters. Int J Vitam Nutr Res. Feb;73(1):39-47. Chaturvedi A, Sarojini G, Devi NL. 1993. 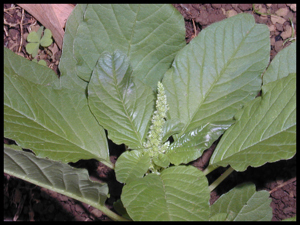 Hypocholesterolemic effect of amaranth seeds (Amaranthus esculantus). Plant Foods Hum Nutr. Jul;44(1):63-70. Cribb, Alan Bridson, and Joan Winifred Cribb. 1986. Wild Medicine in Australia. Sydney, Australia: Fontana Books. De Lucca, Manuel, Jaime Zalles. 1992. Flora Medicinal Boliviana: Diccionario Enciclopedico. La Paz, Bolivia: Editorial Los Amigos Del Libro. Elpel, Thomas J. 2000. Botany in a Day. 4th ed. Pony, MT. : HOPS Press. Larsen T, Thilsted SH, et al. 2003. The leafy vegetable amaranth (Amaranthus gangeticus) is a potent inhibitor of calcium availability and retention in rice-based diets. Br J Nutr. Sep;90(3):521-7. Klimczak I, Malecka M, et al. 2002. Antioxidant activity of ethanolic extracts of amaranth seeds. Nahrung. Jun;46(3):184-6. Oladosu LA, Case AA. 1979. Large animal hepatotoxic and nephrotoxic plants. Vet Hum Toxicol. Oct;21(5):363-5.